We had a tough game today. This team was better than any other we faced this season. We ended up winning 2-0, but they had four solid shots on goal, and it could have easily been 2-4. We had to fight for every inch of the field, and this team was in great physical shape, unlike many of the other teams we faced that tired out in the second half. Today's win give us an undefeated season! 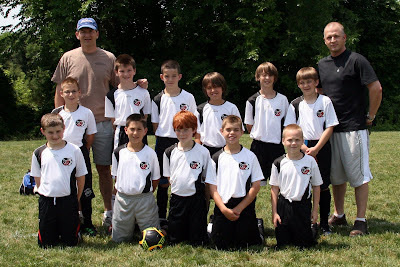 These "Thrashing Gladiators" were a real joy to coach, and head coach Max is a super head-coach. I really hope we see these guys again in the autumn because they are really super, and play so well as a team. Some of these boys, I've coached or worked with for five years now. It's been great watching them become such great athletes. Congratulations to all for an amazing season!